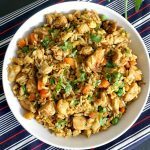 Healthy Chinese Chicken Fried Rice Recipe, the easiest, quickest, and tastiest way of using up leftover rice. 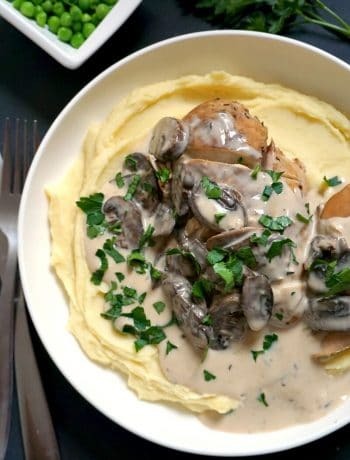 A delicious dinner can be ready in 15 minutes, and what a dinner! No need for take-away tonight, we’ve got Chinese at home! It’s been a while since l last had Chinese food, and this healthy Chinese chicken egg fried rice is just what l needed. Simple and tasty. Spot on! 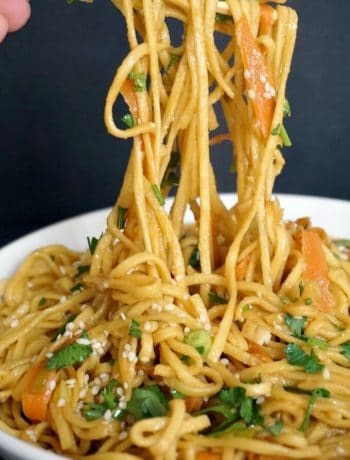 Chinese food is so flavourful and healthy, and mainly because the cooking method, stir-frying, which is frying quickly over a high heat, ensures that the vegetables keep their full flavour and nutritious value. Do not judge Chinese food on take-aways that are greasy and unhealthy, the authentic Chinese food is just divine. Rice is the staple food all over Asia and it is cooked in thousands ways, including some heavenly desserts. I was first introduced to Chinese food when I came to the UK and savoured some amazing dishes in China Town in London. What a great place that is! So hard to choose where to eat, as all restaurants offer delicious dishes. 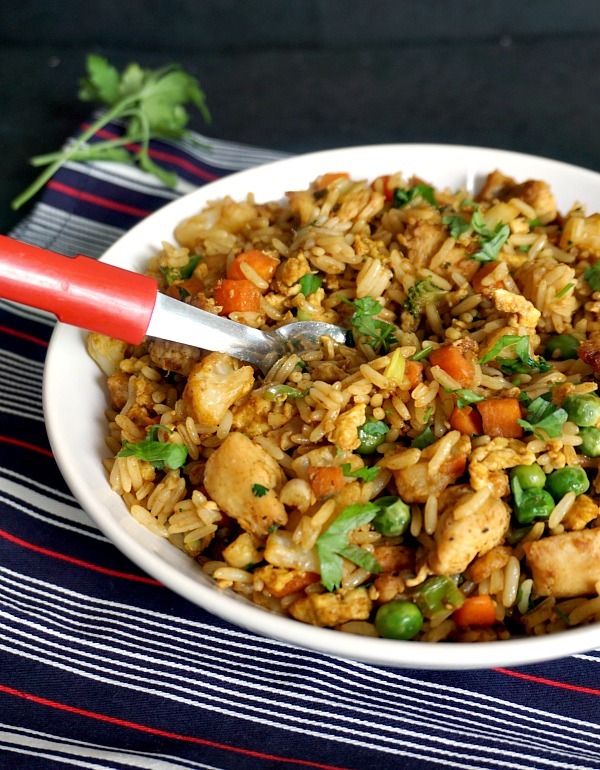 How do you make Chinese chicken fried rice? This healthy Chinese chicken egg fried rice is my take on the classic dish and I must say that I just loved it. The secret is to use leftover rice, and then your new dish is ready in few minutes. I don’t know about you, but I always seem to cook more rice than neeeded. And I don’t really like plain rice that has been re-heated, it just doesn’t not taste as nice. But throw in some scrambled eggs, some nice veggies and chicken, and you are in for a treat. 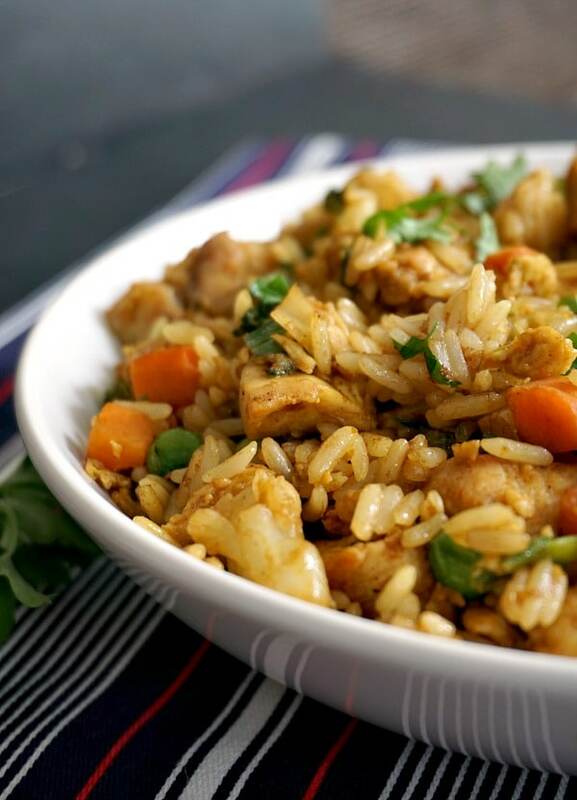 Chicken can either be leftover from another meal or cooked with the fried rice. Either way, you still do not have to waste too much time, as stir-frying the chicken can be done in two shakes of a lamb’s tail. I always cut the chicken in smaller pieces to make sure it cooks quickly, and properly; I am paranoid about chicken not being cooked through. In fact, I like all meat to be cooked through, even steak, I really don’t buy it that rare stake is tasty. Come on, really? Bloody meat is tasty? Yuck, no thank you, l like the meat well done. What can I add to chicken fried rice? 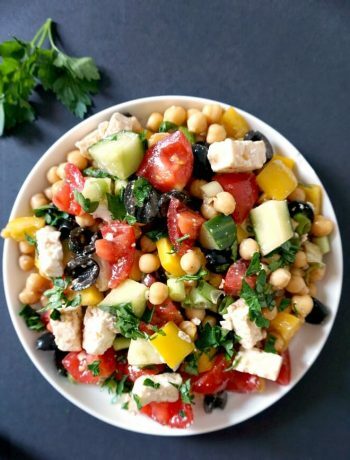 I have used frozen veggies for this recipe, I think they work wonderfully here, but if you have fresh ones, that’s ok. I bought a bag of mixed frozen vegetables that included peas, cauliflower, carrots and broccoli and thought it could not have been a better mix, it was exactly want I needed. Peas and carrots give a sweeter touch to the fried rice, but if you want to add any other vegetables, that is absolutely fine. Adding turmeric might be a bit of a twist, I just liked the colour, so really had to use it. The whole dish is a party of wonderful flavours, so intense, yet not too strong. Add chilli too, if you like, I chose to leave it out thinking that my little one might give it a go. Well, that did not happen, so, nevermind. Whether you are after a nice Tofu, broccoli and mushroom stir fry with basmati rice, or a Chicken and broccoli stir fry with rice, I have got recipes to cater for all tastes and bugets. Cooking is easy, isn’t it? 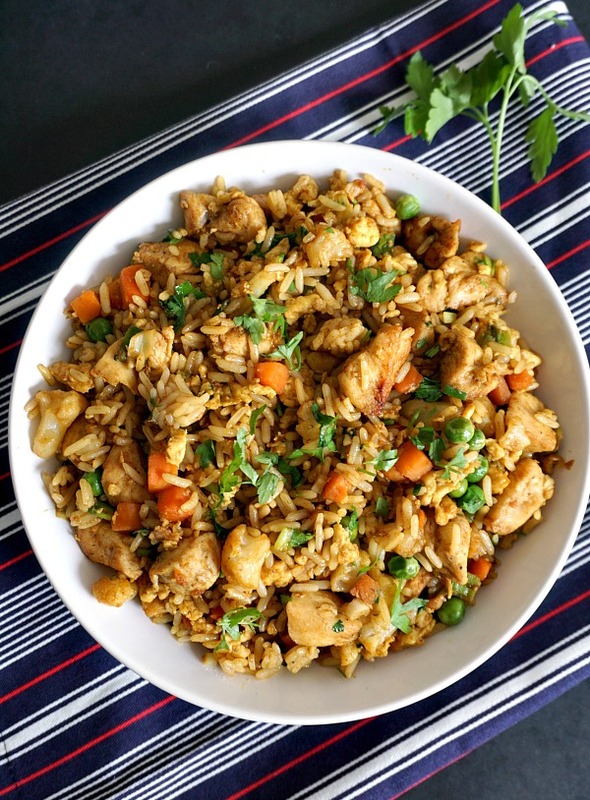 If you’ve tried my HEALTHY CHINESE CHICKEN EGG FRIED RICE RECIPE or any other recipe on the blog then don’t forget to rate the recipe and let me know how you got on in the comments below, I love hearing from you! You can also FOLLOW ME on FACEBOOK, and PINTEREST to see more delicious food and what I’m getting up to. Healthy Chinese Chicken Egg ried rice recipe, the easiest, quickest and tastiest way to use leftover rice. So flavourful and tasty, this dish makes a perfect 15-minute dinner. Heat up the wok, cut the chicken into small pieces and season with salt, pepeper and garlic powder. Add one tablespoon of oil to the wok and stir fry on high heat until the chicken is cooked through and slightly browned. Chop the spring onions, garlic and ginger, add the wok together with the remaing oil and stir fry for 30 seconds. Beat the eggs slightly, add them to the wok and scramble them, then add the cooked rice, vegetables chicken, sesame oil, soy sauce, oyster sauce and mix well to combine. Stir fry for a further 3 minutes, then add the chopped parsley and remove from the heat.